You know those projects that you start but never finish? Dude, what’s UP with that?! I have a gazillion of them lying around my house: half-dissected furniture…….sewing projects with threads hanging loose…..and knitted garments with knitting needles still attached! This year, however, let’s vow to FINISH. WHAT. WE. START! 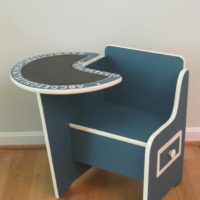 And voila, thanks to the support from OnlineFabricStore.net! Finally it’s DOOOONNNEEE! Woo hoo! One less piece of furniture in my messy garage! Now I’ve got a cozy corner in my master bedroom, which still needs a lot of decorating. It’s been three years and all I’ve been able to do is remove wallpaper and paint the walls a pretty Sherwin Williams Rainwashed! It’s amazing how many things you learn when you do a project that you’ve never done before. Oh, the skillz you acquire! And yes….there will be trial and error. This is just a sampling of the decorative tacks I wasted in trying to get them hammered in PROPERLY! 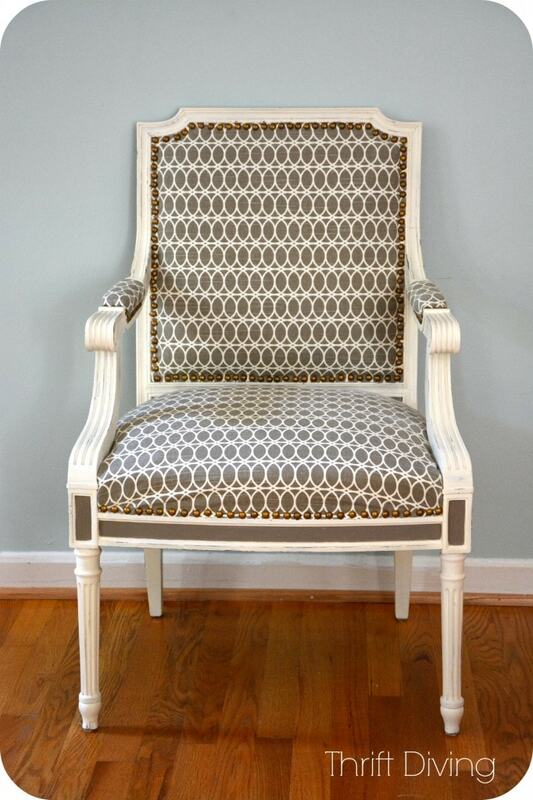 I’ve done a previous reupholstered chair ions ago when I started this blog (hahaha, looking at that post now makes me laugh at how ridiculously fuzzy my pictures!). 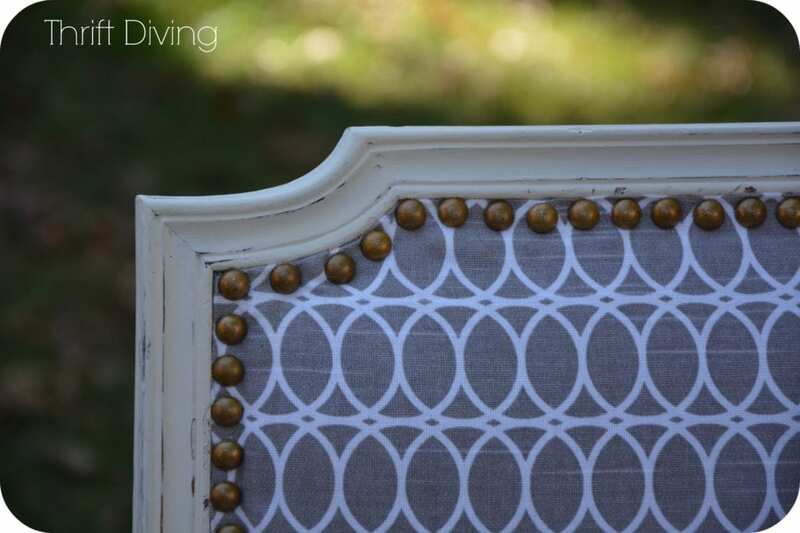 But that chair was a piece of cake compared to nailing on 276 decorative tacks onto a vintage chair makeover when you’ve never done it before! EEK! For long-term readers of this blog (lol, maybe five of you brave souls?? Shout out to y’all! 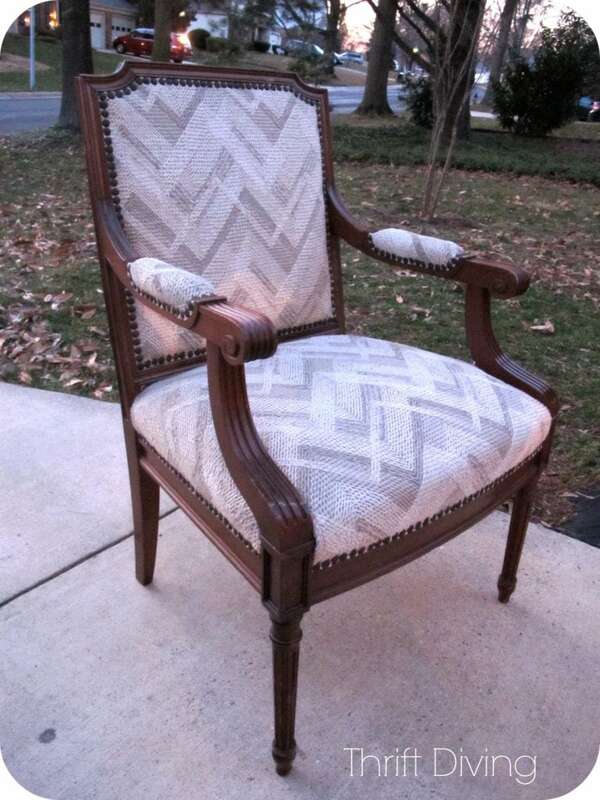 ), you’ll remember this chair from last year when I attempted to reupholster the chair with a butter knife…..you know, the “tool” that you resort to when you can’t find any real tools? Yeah–that. 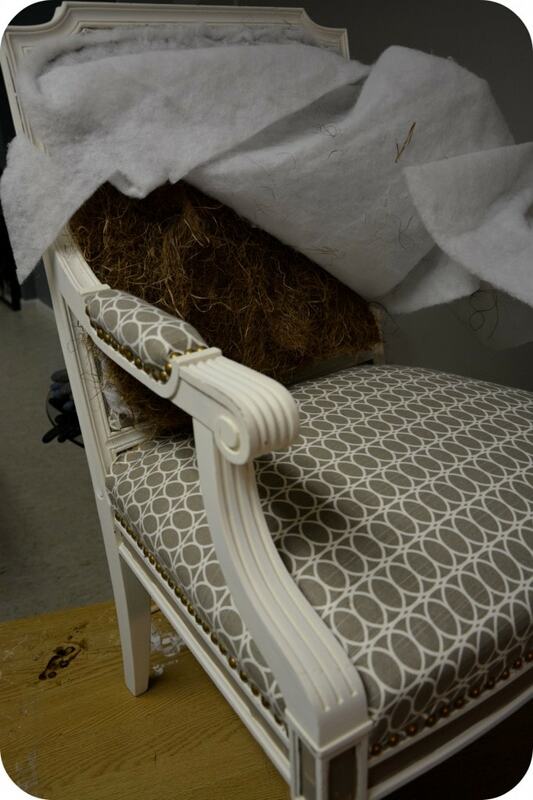 Inside of the chair….NOT pretty! I think this is the most fun (and most difficult!) 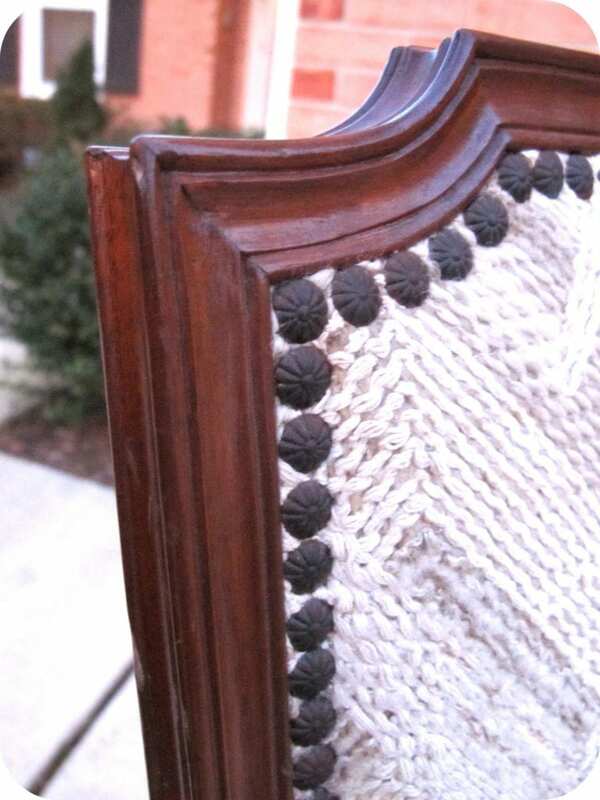 part of reupholstering a chair, too. It all depends on the look you’re going for. I really wanted something classic and pretty. 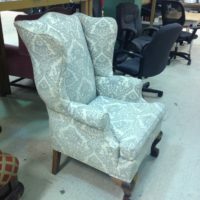 It’s a very traditional-looking chair, so I didn’t want to go all modern and crazy on it. 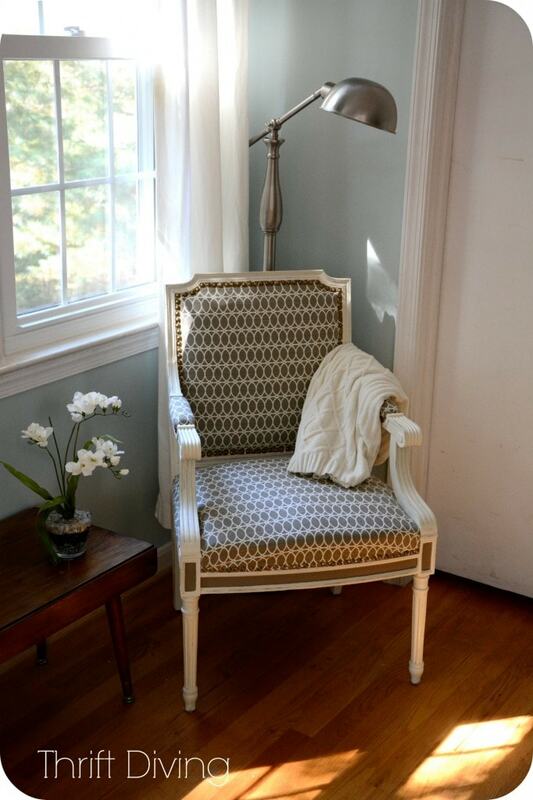 Plus, I knew I wanted it in my bedroom, and with the Rainwashed paint colors, I knew a white chair with tan fabric would look really nice! Did you know that HGTV makes fabric now?! Click here to check out their line of fabrics. Actually, OnlineFabricStore.net is a great place to buy fabrics online. The selection is awesome and I find their site cleaner to use than some other online fabric stores! 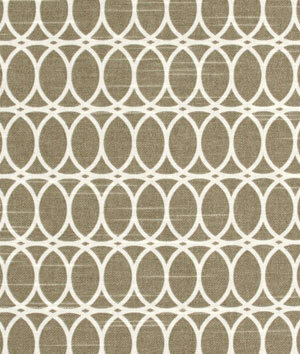 Here’s the HGTV fabric I chose, which was perfect! 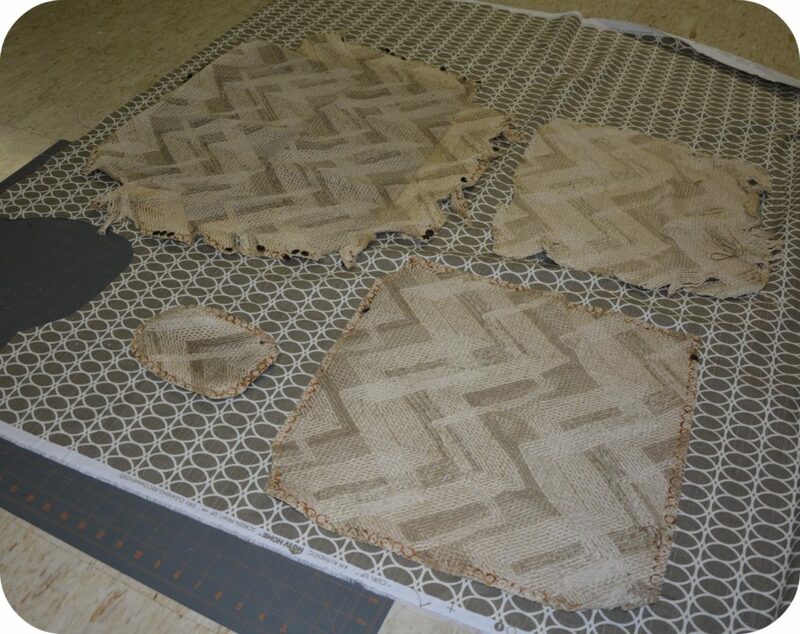 Always use the old pieces of fabric as a pattern, and be sure to add in seam allowances (jeez….that old fabric was HORRIBLE). But I did almost decide to give up after getting started because it just wasn’t turning out how I had envisioned….But hey, how will you ever learn if you run from challenges? I told myself that DIY’ers never quit :). 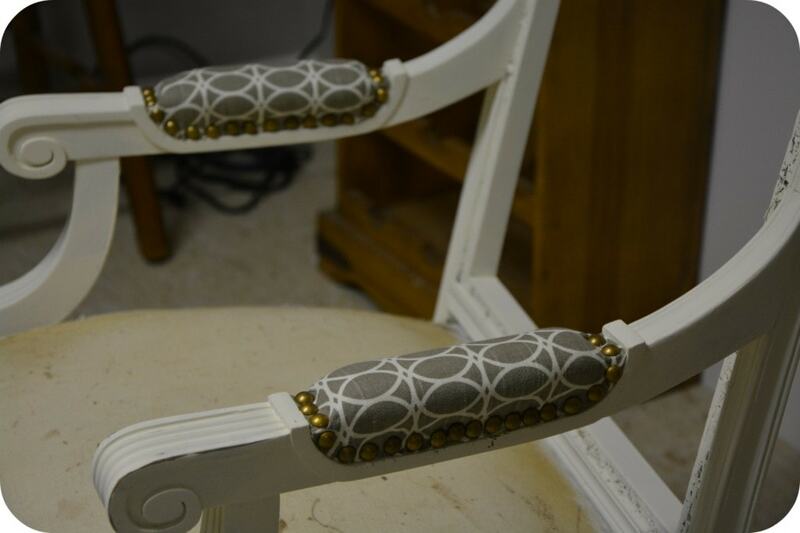 I started with the arm rests because they looked to be “easier” than the back and seat, though! I had ordered a box of 1000 decorative tacks from OnlineFabricStore.Net. These are the ones I ordered. I loved the gold! And I have plenty of them left for another project! 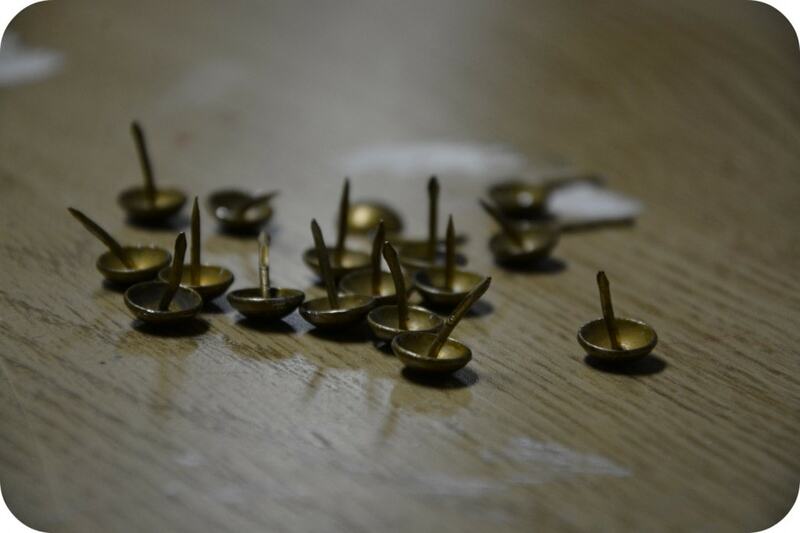 Oh no!…….C R O O K E D Decorative Tacks! Use a piece of paper (or a ruler) to make the distance between two tacks. 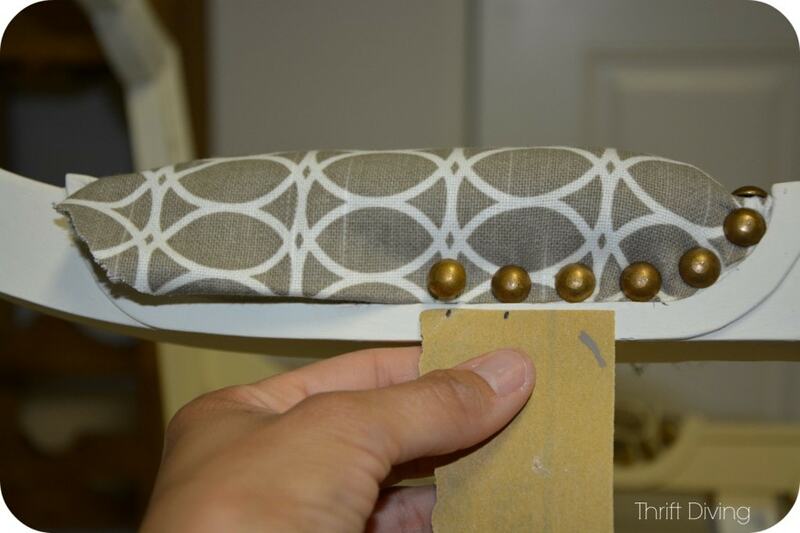 Do your best to make each notch falls in the center of the decorative tack. I tried to use a little tool that they’d found online to keep decorative tacks straight, but it didn’t work well for me. I found that by placing one at a time, and just using my makeshift spacer, it worked much better. I felt like I had more control over my tacks :). Give it a whirl. After about the first 25, you actually start finding it easier to drive them in! This is the tack hammer I used, which is much lighter than a traditional hammer, and easier to drill them in. Other than the tack hammer, I found a regular hammer helpful in removing tacks. You can always use a tack puller . One of the nastiest things about making over old thrift store chairs is the innards. You never know what you’ll find!! YUCK! 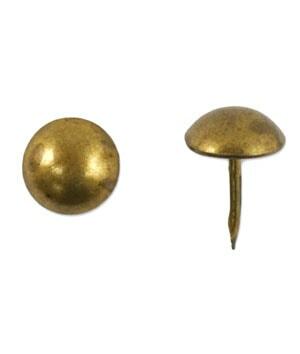 But sometimes, you find some “gold” inside……in other words….good, solid materials that you should reuse if you can. 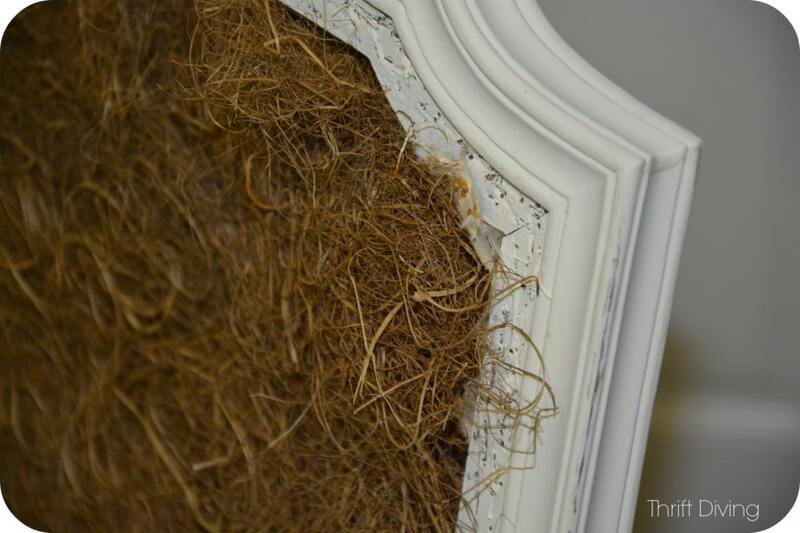 Yes, my friends…..that’s authentic horse hair!!! 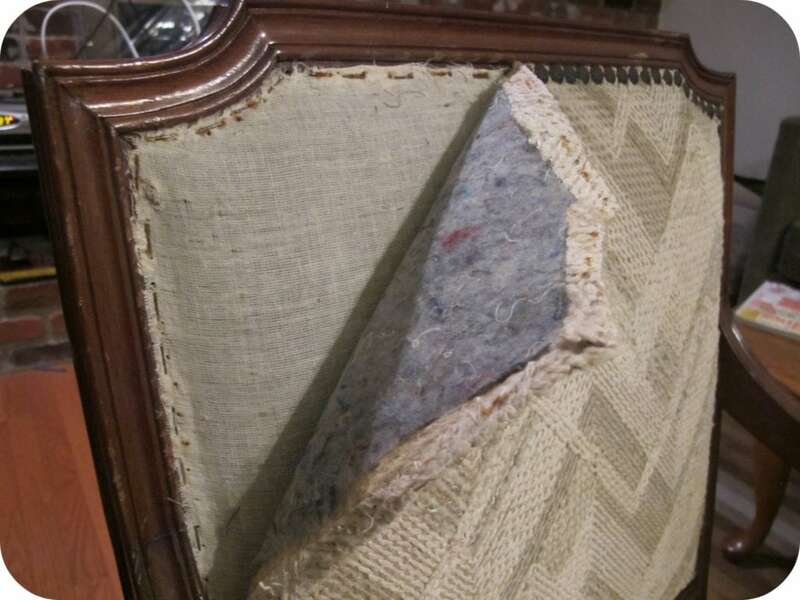 According to my reader and ‘net buddy, Scott, upholstery shops sell a blend of hog and horse hair (and it’s expensive, too!! ), which is used to overlay springs to provide some padding and protection. So yeah, this definitely got reused! Then I stapled an extra layer of batting over the stuffing for more padding. 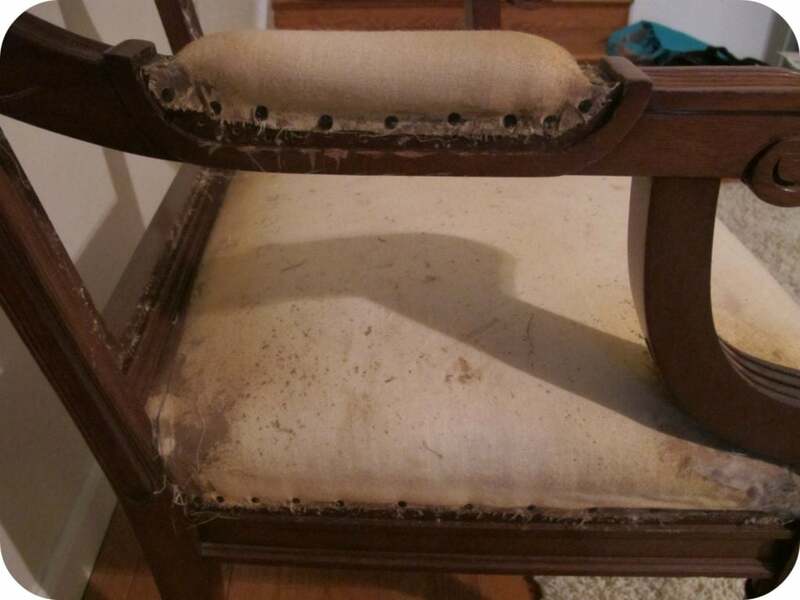 Oh, and to see more ugly “BEFORE” shots of this chair, go see last year’s post. If You’re Not Sure How to Get Started…. I’m super stoked! I love how it turned out! The back of the chair. 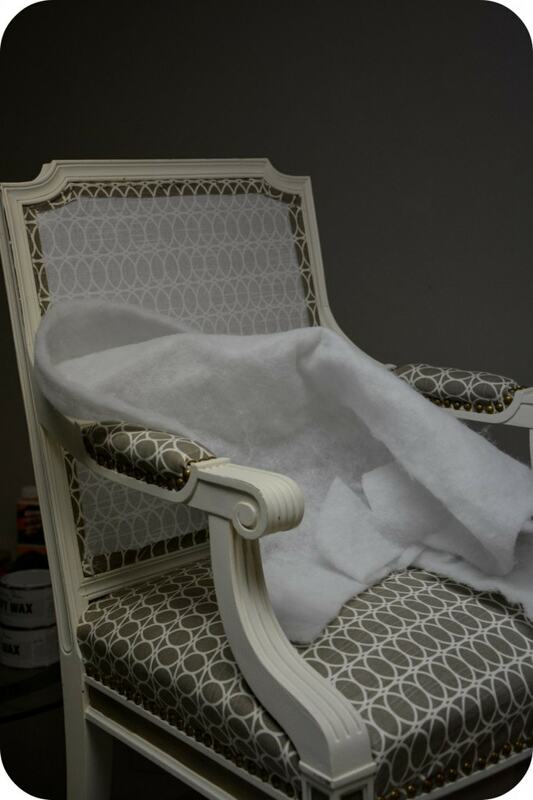 I forgot to mention that I also used Annie Sloan Old White for the chair body, and in the cut-outs of the bottom of the chair I used Annie Sloan Coco. Paint brushes, of course! 🙂 I love the Purdy brand. TOTAL COST: About $93! 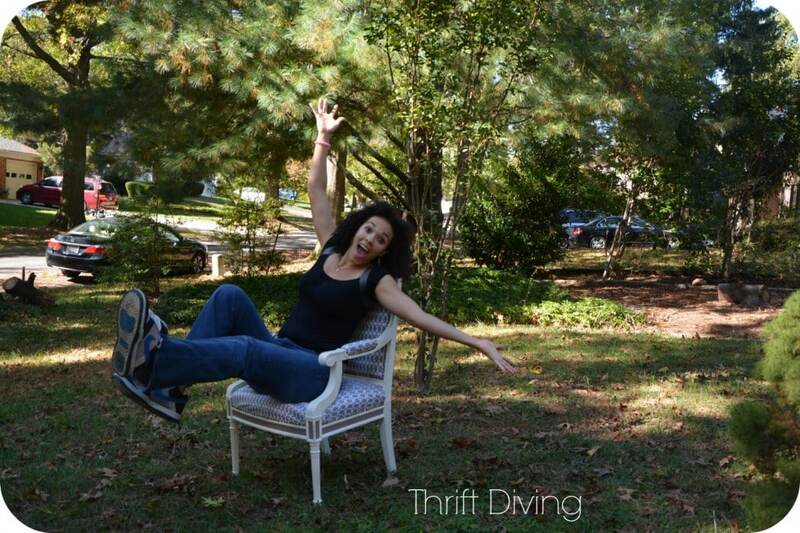 Not bad for a super heavy, sturdy vintage chair! 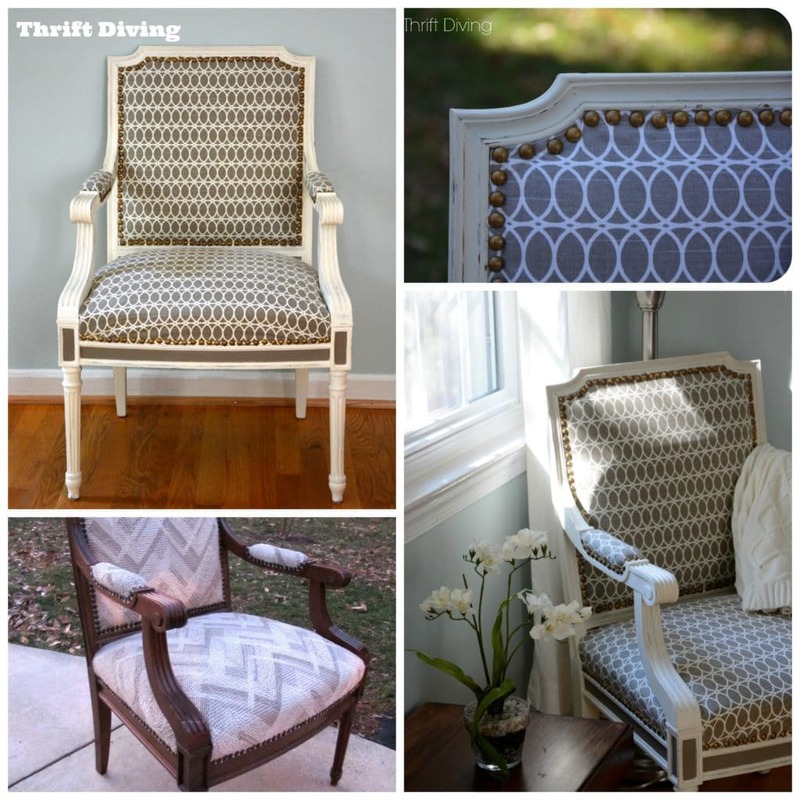 Do you have a chair makeover that you’ve been wanting to do? Tell me all about it in the comments section below! Some supplies were sponsored by OnlineFabricStore.net. However, this post is strictly my own creativity, and all my crazy opinions are my own. You made that chair look FABULOUS! The chair looks fantastic! Nice work! 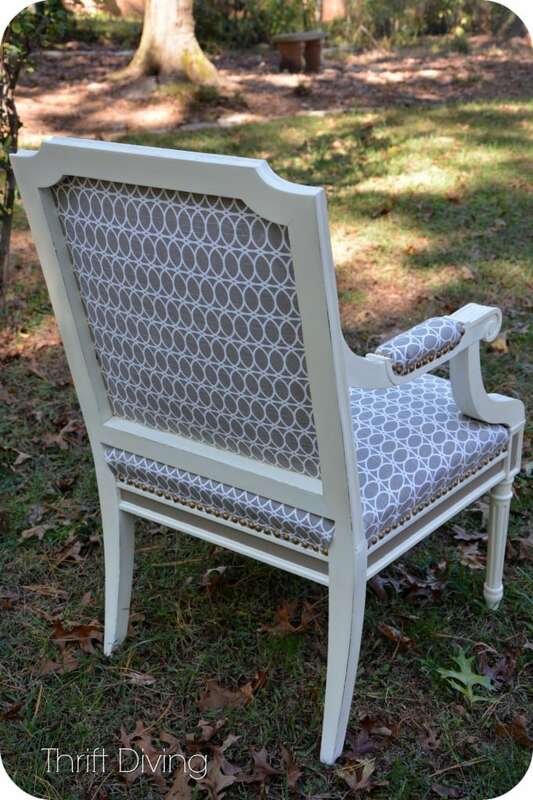 I am planning to reupholster dining chairs like this one that require fabric on the backside of the chair, but I am not sure how to do this. 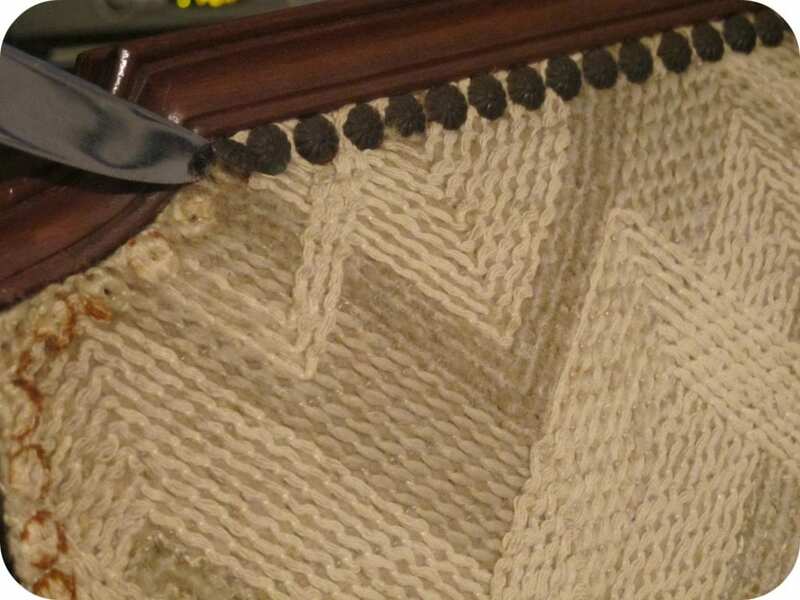 The photos in this blog are helpful but could you please explain the steps of how to upholster the back of a chair like one in this blog post? i would really appreciate it. I also follow your Youtube videos and they are great. A video explaining the steps would be great too. Thank you in advance!! 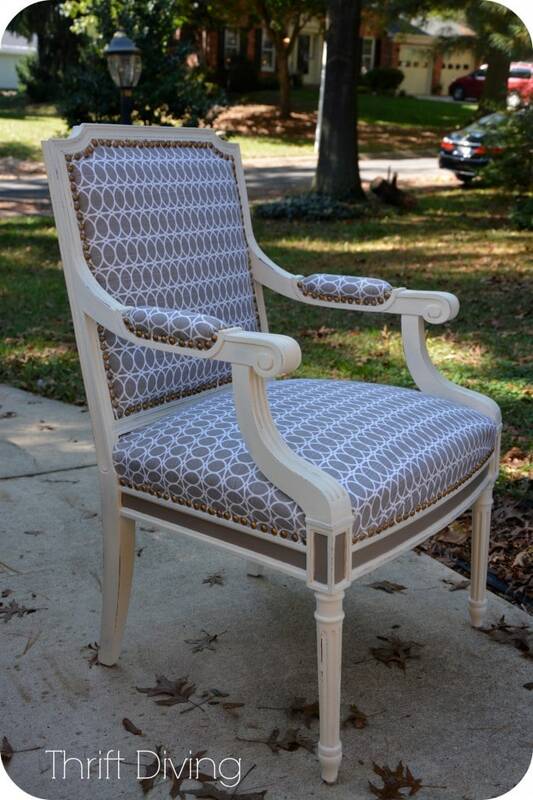 I love this finished chair. It looks beautiful in your bedroom and what a lovely shot of it too with the sun shining through the window. 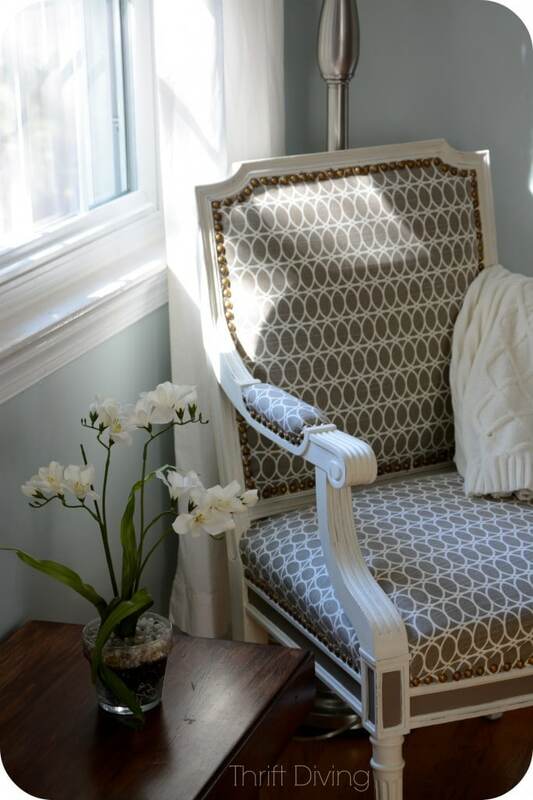 The upholstery gives it a fresh look yet as you say, keeps it classic. You were lucky to find such a well-made chair. As the saying goes, they don’t make them like the used to. I always look forward to your before and after projects, Serena. You know what my favorite part of this DIY is? How you painted the little grey panel areas that some folks would have just left the same color as the rest! I think that added a heck of a lot to this project! It’s awfully pretty! 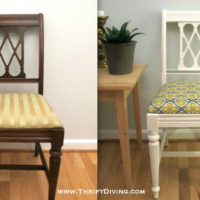 This is very good work on chair makeover. It looks very good to new from old design. I like you great job. Serena, You did an awesome job! I love it! I was frustrated beyond measure when I couldn’t figure out how I’m going to get the fabric to stay without stapling it an hiding staples under tacks (something I figured I might not be able to do with my amazing never-done-diy-skills). Now I understand. You fold the seam and tack. It makes perfect sense. Thank goodness my diy chairs are 5500+ miles away, I might want to rack up some experience before going into a project of this magnitude.